Well I have started on my S&W sandbox setting. The little barony far far in the western frontier. First of all the walled city of Raven's Keep came out really well. It is a city of around 8000 (or more) people. I placed it in the middle of the map with a road going back to the eastern kingdom. The western road comes out and joins a north south road. It is well know that the city was founded long ago but the history is very mysterious. The most popular story is the city was founded because of a wellspring. A never ending wellspring that gives the entire city running water unless the cold freezes it. The water drains down to an ancient sewer that depths are unknown. The city is surrounded by bountiful fields that are are watered by the wellspring. The oldest and most poplar religion of the people is of the Grain Goddess Keres. The city will live and breath the ancient festivals dominated by this goddess including one inspired by the original 70s movie The Wicker Man. There are other churches as well. A few will be written by the players. The scale is rather small. One inch equal five miles. On an 8.5 x 11 inch piece of paper not a large setting but I have packed this page with lots of possibilities. There are two dungeons the simple Bloodrock Castle and The Black Stairs less than a day away. From Blog to Blog to Blog! ALAS the West Marches! After starting to read about Dwimmermount I went to Greyhawk Grognard and then found one of the most incredible Old School Blog sites that I have ever seen: Ars Lundi and the West March post. Wow I have to say that there just might be some universal consciousness out there. A world much like the one that has been on my mind for years. BUT the level of detail and the ideas that I can mine from this! His blog is one of the most impressive I have ever seen. Well reading over the west marches has given me the UMPH! to get my setting started. Well I have been unemployed for 5 weeks. Should have would have could have lot's of projects. I will be starting up on the first back at the plant that laid me off. Should I call my setting Odd Earth? When I originally posted about it on the Odd Guild many years ago it was seemingly ignored. The Odd Guild ends and then restarts and lo and behold a setting with the name I came up with: Odd Earth. I of course joined the group but no one gave me credit for the concept. I suppose that none remember. I did mention another direction to go with Odd Earth but not one person has responded. Does it matter really? I hope not. I am still going to work on a setting that starts from the inside out. Almost every campaign setting starts out with a huge world map that they cannot possibly finish. It will be a very European and primordial setting. A barony upon a hill with a rather large town. A barony foolishly built on ruins that unbeknown to the town people is a huge rotting dungeon. The Barony was a former dungeon reclaimed by the current's baron's father. It is the farthest to the west of the frontier lands. Some 14 days to the east is the great imperial city which will not be detailed until I get to it. The Barony shall be Map 0, 0 on an 8.5 x 11 inch piece of paper. The first number is Vertical and the second Horizontal Positive (up and left) negative (down and right). Perhaps someone shall take interest once I get the first map down. I want it to be totally old school as crude hand drawn maps and dungeons. I want the artwork to be crude line drawings. Most of all I want the story to be good. If this ever gets done (as well as Temple of the Monkey God) I may just LULU it myself. All my notes on the Barony really are looking good. I want a "Towns of the Outlands" type document that one can read over and just enjoy it even if they never play it. Most of all it shall not become a job but a work of joy. An ancient world lost in time where the capital of the world is Babylon, the City of a Thousand Gods. Where the Old Gods walk the Earth. To the north is the Icelands. 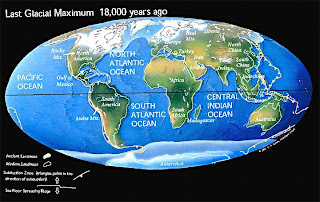 The oceans are low and there are far more lands of man and monster. The base of this setting will be the Little Barony located somewhere around where England is today some mythic age possibly 15,000 to 25,000 years ago. I want to include Silurian animals and forest. 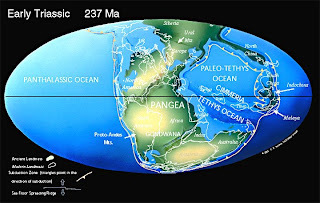 Pangea or Ice age world with the sea levels a few hundred feet lower? My original Odd Earth concept and post on the old ODD Guild site was a very simple concept. I finally found the old file that contained the original post on my old computer. Odd Earth is our world in a lost ancient time. The ice caps are huge and there are now massive continents making the oceans and seas smaller. The world is very primitive as volcanoes and savage storms beat down upon mankind. Lands can be changed and destroyed by the violent earthquakes, floods, and other disasters. Some lands have disappeared all together. Different areas of the world will correspond to the cultures and lands of history and today but in a more magical ancient forgotten time. It is a time of great and terrible wars (Chainmail anyone?) that tear across the different lands destroying and conquering. Odd Earth is very sparsely populated and with all its centuries of wars and destruction the lands are filled with forgotten dungeons and crypts. There is a land that lies many miles from what will be off the coast of England. This land long flooded and forgotten is a land full of ancient tales. The little growing village lies right outside the Baron's castle. From here you shall adventure and clear out the dungeons in the area. This village like the Odd Earth shall grow into a town in a few years and then a city. The players themselves may become barons and start their own Baronies. All is rumored not well. To the south the Black Dragon's goblins attack outlying farms and lumber camps. To the east the villain only know as the Black Baron is harassing and claiming some of the lands of this fair Barony. To the north a vile army of the undead frequently attacks small settlements. The baron is loyal to the King to the east though none from this village have ever traveled to his lands. Far into the eastern lands is the rumored city of Babylon, a city older than any other built before time, a city of a thousand gods. It is where the Emperor of the world lives. Where most people go wrong with making a setting is they start with a huge map and then try to fill it with details. Even with a large group you just can't do it. My Original concept for Odd Earth was to start out with a small land and completely detail it then expand in all directions from that map. After having my module critiqued by one of the nameless "new masters" it seems that I need to go back to the drawing board. That's okay. At least I know what I need to improve. I knew that the idea was sound but the presentation was weak. I will get with a close friend who will go over it for me and won't go Chthulu Insane from my writings and grammer. I have another who can do artwork. I will be redrawing the maps with no detail and then Gimping the maps. I think I am ging to assemble a game studio IF they agree. For the love of the game and not for the money! Well I am going out on a limb and actually going to finish a module and try and get someone to publish it. I really like the vibe of Brave Halfling publishing and they are asking for submissions. Being that they are an established OSR company I feel they are my best choice because of their OSR fame. The Temple of the Monkey god is going to be a really tough wilderness and dungeon adventure. It will require many Men-at-arms to succeed. IF the players are crafty they will survive with no problem. In the old days MY parties would wipe out most of the enemy with missile attacks before they got to us then dispatch them by sword! Wow I played Swords and Wizardry last night with my two girls. They were both elves. My 11 year old rolled a fighter elf and my oldest 13 year old rolled a fighter magic user elf. I had them hire four Men at arms and then sent them into the dungeon. They were there to rescue the Baron's Daughter who had been kidnapped by the Kobolds. Bloodrock Keep was the ruins they haunt and had never been a problem until now. The heroines went in swords swinging and lost the initiative and two of the four retainers died right away. The girls managed to fight off and kill the rest of the kobolds. They then went back to town and hired a set of twing chin and shield fighters, a thief, and a second level wizard. They kicked in the door of the next room for a surprise attack and did they ever miss! My two girls quickly dispatched two of the surpiried guards and the Mage and rogue killed two as well. The next round one of the fighters were dead as well as the mage. The rest of the combat ended messily with all the guards being killed. Only one of the fighters and the thief was left. In the corner of the room was a cell that contained a 2nd level elf. While they were talking goblins busted in from the north room and killed the fighter and the thief NPC. The more experienced elf NPC showed the players the use of a bow and the goblins were killed. They will play again soon.